Doris Antons, age 80, of rural Center Junction, died Thursday, October 2, 2008 at St. Luke's Hospital Cedar Rapids following a brief illness. Funeral services were held at 11:00 Monday morning, October 6, 2008 at the Wayne Zion Lutheran Church, rural Monticello with interment in the Wyoming Cemetery. Rev. Jonathan Kosec officiated at the services. Friends called from 3 until 7 Sunday at the Goettsch Funeral Home, Anamosa. Surviving are three children, Patricia (John) Knake, Onslow, William (Pam) Antone, Brooklyn, Randy (Sandy) Antone, Anamosa, her sister, Verna Mae (John) Parham, Anamosa, a sister-in-law, Pauline Antons, Center Junction. She was preceded in death by her parents, her husband Raymond, a sister, Idalene Houston, and a brother Donald Westphal. Doris Westphal was born August 24, 1928, at Anamosa, Iowa. She was the daughter of William and Minnie (Martensen) Westphal. 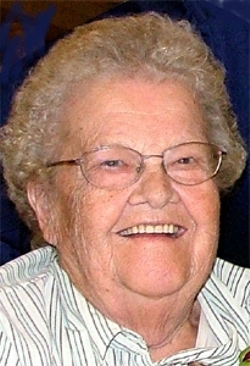 Doris received her early education in the Wyoming Schools and graduated from the Olin High School with the class of 1947. She worked on the family farm and later on the farm of Elmer and Anna Hinrichs. Doris Westphal and Raymond Antons were married September 9, 1948 at the Wayne Zion Lutheran Church. The couple farmed in the Center Junction area. Raymond preceded her in death on July 29, 1998. Doris was an active member of the Wayne Zion Lutheran Church. She also enjoyed her morning coffee group in Onslow, Senior Dining in Wyoming and playing Bingo.